Reform of National Non-Domestic Rates. Although there have been many statements of principle on the usefulness of basing business taxation on land value as yet there has been very little detailed research into how such as transformation could be carried out and what the actual consequences would be. This paper endeavours to take a first step to meet this need by exploring how the present arrangements for business rates, the National Non-Domestic Rate (NNDR), could be transformed into a charge based on site-value-rating (SVR) and what the likely outcomes would be with a view to clarifying what further investigations might most usefully be undertaken. This is such a powerful idea, and one that has been so comprehensively ignored by governments, that the case for a thorough official effort to design a workable system seems to us to be overwhelming. In particular, significant adjustment costs would be merited if the inefficient and iniquitous system of business rates could be swept away and replaced by an LVT. In explaining the value of such a reform, the report quoted the Nobel Prize-winning economist William Vickrey: ‘The property tax is, economically speaking, a combination of one of the worst taxes—the part that is assessed on real estate improvements …—and one of the best taxes—the tax on land’. The basic idea of converting business rates to a site value rating system is to eliminates the bad part, which is essentially a tax on capital that inhibits investment in capital – so badly need in the uk to increase labour productivity - and retain and extend the application of the good bit, the tax on land. The present system of business rates penalises investment in capital but at the same time, by leaving undeveloped land untaxed, it encourages its speculative hoarding and at the same time lets the uplift in land values due to public policy and investment pass as a windfall to the landowner rather than provide the public revenue needed to pay for the investment that produced the uplift in the first place. The move of business rates onto a site value basis would not only address all these three issues simultaneously but could also be used to dampen the boom-bust property cycles that have such a negative impact on the economy. There is also a growing appreciation of the economic and financial significance of land value in both national and international institutions. In the wake of 2007-8 global financial crisis (GFC), the IMF and OECD engaged with the subject of land and other non-produced assets in relation to financial stability. Governments in the EU and beyond are now required to include a valuation of land in each year’s national accounts. In the UK this is the Blue Book, and its 2017 edition introduced aggregate land value estimates going back to 1995 for the first time. To support this initiative, EUROSTAT and OECD have compiled guidance on how land value can be estimated, either directly from data on land value or indirectly from property value. Although only compiled as an aggregate for the nation, the process itself ensures many prerequisites for local valuation are in place; land value is already being determined for the UK! The paper is set out as follows. Following this introduction Section II gives a review of the UK commercial property market with respect to its composition, capital value and types of investment. It also surveys the situation with regard to undeveloped land, particularly that available for domestic property. Section III introduces a simple model of how the transformation might be implemented; after comparing the key features of NNDR and SVR, a five-step phased transition to SVR is described and some of the economic mechanisms which will determine the consequences of this are identified. Section IV illustrates some important outcomes of the transformation by exploring the effects firstly on marginal sites, then owner-occupied sites and finally tenanted sites with differing states of development. Section V predicts the effects of the reform on several aspects of the economy. Finally, Section VI concludes the paper and suggests further areas of research that will need to be conducted and sets the proposed reform in the larger context of a need for a fundamental overhaul of UK taxation. Before going into the details of the tax reform we will set the scene by giving an overview of the UK commercial property market which provides the tax base for business rates. The most recent Investment Forum Report provides figures for 2016 year-end; they are based on rateable values with revisions based on IPD (Investment Property Databank) rental growth. The resulting values are 5% lower than 2015, reflecting uncertainties over Brexit. Nevertheless, there had been several years of increasing capital value which now just exceeds those reached prior to the GFC. The total capital value of UK commercial property is estimated as £883 billion. Table 1 shows the basic composition of the market, of which 37.8% is located in London. Not included are Central Government stock estimated at around £200 billion and Local Authority stock at £130 billion. Of significance, when exploring a shift of the tax base onto land, undeveloped land or incomplete developments are not included. For comparison, residential total stock value for the UK is £6,210 billion. Some 45% (by proportion of the stock) of the private commercial sector is owner-occupied (and valued at £188bn). This sector tends to contain the less valuable property and much of it is in the hands of large corporations. Only 68 retail companies between them hold £68 billion of property assets. There are 755 companies with more than £20 million of property assets who between them hold around £160 billion of property which is 85% of the total by value. The investment market, consisting of some 20,000 buildings, is concentrated in high value properties. Table 2 identifies the main owners of commercial property held as investments. Nearly half UK investment property is owned for the purpose of providing returns to UK pension funds and other personal savings schemes. However, commercial property only constitutes 5% of their total funds invested so the impact of a transfer to SVR on the overall value of these funds, for better or worse, should be small. The owner-occupied and rented sectors of the property market are likely to be affected differently by a reform of business rates and they will be considered separately in Section IV. The UK Commercial Property Lending Market is the subject of a twice-yearly detailed report by the Department of Corporate Development of the De Montfort University. The year-end 2016 report indicated general recovery from the unsettling period following GFC, and a partial recovery from Brexit referendum uncertainty. In the years leading up to GFC there had been a large amount of lending against commercial property in the UK at high loan to value ratios. These totalled £228.3 billion in 2010, with 20% being in default or breach of covenant. Such lending has now fallen to £208.7 billion, a slight rise over previous year; loan-to-value has reduced to just under 60% and loans in default have become relatively insignificant. The report observes an extended investment cycle due to low interest rates and economic support. It expects market buoyancy to continue whilst these remain. This market sees periodic turmoil; any reform of NNDR needs to take into account possible effects on the commercial property lending market, and should aim towards stability and reduced speculative exuberance, rather than the volatility that characterises the prevailing economic and fiscal arrangement. The extension of the tax base to derelict property, vacant and unused land is a very significant aspect of the move from NNDR to SVR. As will be shown in Section IV this will have benefits for productive land users that extend throughout the economy. Data for this land is much less readily available than that which is already on the rates register. The Republic of Ireland has recently introduced a vacant site levy to encourage the development of land and Wales is also preparing to introduce a similar tax under its newly devolved powers. In this proposal this issue would be covered not by introducing a new tax but by the extension and modification of the already existing business rates. How much of unused land is there? Data for brownfield sites, known as Previously Developed Land used to be collected nationally. The survey of 2012 had 8860 entries with a total area of 23,000 ha, but this was based on only a 50% return from local authorities. Hence the actual amount could well be double this. More recently Government Legislation has required each Local Authority to produce its own register and these were due to be completed by the beginning of 2018. These will give a more accurate record of vacant urbane land. If the highest and best use for this land is for domestic housing, then the value of this is very significant. Muellbauer estimated that even if just land with planning permission for domestic use were included, it might add 25% to the capital value of the commercial property tax base. The subject of this unused land in the UK, has come under public scrutiny recently in relation to the domestic housing market. Following the Autumn Budget 2017, a review of build-out delays has recently been established. A recent report commissioned for Barratts plc presents a helpful model of the “land bank” in England. It identified some 0.8 million homes as being in a 4-stage pipeline described as: A - pre-planning, B - planning application to consent, C – consent to start of build, D – site build-out to completion. Of 685,000 consented housing units (B+C+D), 79.7% had detailed planning consent, the other having outline permission. Of those with detailed permission, 51.8% had started builds (D). In 2015/6 there were 142,000 completions but 262,000 planning permissions over the year (England); this ratio has stayed between 54.2-63.4% over the last 6 years. Some 55.5% of permissions are held by “non-builders” such as landowners or agents. These tend to have higher proportions of outline permissions and of lapsed permissions; London sees much of these. The Barratts report emphasises the importance of maintaining and even extending the pipeline to ensure an adequate flow-through of home completions. It describes how local markets can limit the outflow of homes, implying large developments (e.g. 500+ homes) will take several years to complete. The important A-stage includes identifying and securing land for residential development and preparation of a planning submission; less clear from the report is where the land comes from, perhaps either green or brown-fields. All of these aspects of the commercial property and land markets need to be considered when analysing the effects of implementing site-value rating for non-domestic property and land. One reform that would help to bring more transparency to the land market would be to require that options for future purchase which are often established in the early A stage should be registered with the Land Registry in order to be enforceable. This would also assist with the valuing of unused land with the potential to be developed. Recently there has also been growing political interest in the related issue of land value capture. Land values are determined almost entirely by externalities. When there is provision of new services of various kinds land values increase. When there is a designated change of use, particularly from agricultural to use for domestic housing there can be dramatic increase in value. Under present arrangements these uplifts in value fall mainly to the owner rather than to the provider of the services. In their 2017 election manifesto the Conservative Party which is now in Government stated: And we will work with private and public-sector house builders to capture the increase in land value created when they build to reinvest in local infrastructure, essential services and further housing, making it both easier and more certain that public sector landowners, and communities themselves, benefit from the increase in land value from urban regeneration and development. To follow this up the Communities and Local Government Select Committee has recently launched an inquiry on this subject. However, as the Mirrlees Report pointed out, since the Second World War there have been a series of unsuccessful attempts to capture uplifts in land value by one-off charges of various kinds. An annual site-based levy offers an alternative strategy that could be more effective in capturing land values over the long term. This section compares the basic features of the current system of business rates and the proposed reformed system based on site value ratings. As stated by Mirrlees and Connellan it is clear that any transition would have to gradual. To give an illustration of how this could be done we propose a five-stage transition as suggested by Lyons and Wightman. Some of the economic mechanisms that need to be taken into account in considering the consequences of the reform are also described. The present system of non-domestic property taxation has a long history going back over four hundred years. For a long time, it was associated with the raising of revenue for local government. Following the Local Government Finance Act of 1998 billing and collection became the responsibility of the local authorities who are part-funded by the tax. At the time, receipts were pooled centrally and then redistributed, rather than being retained locally; more recently at least some receipts are retained locally. Last year (16/17) NNDR was expected to raise £23.5 billion which was 3.22% of total tax revenue. A second tax that falls on business property is the Stamp Duty Land Tax. As it is only imposed on transactions it has the effect of hindered market transactions and as with the levying of business rates falls on both the land and the capital. A wider ranging reform of business taxes would include the phasing out of SDLT at the same time as transitioning to a land-based levy. 1. The taxable unit is the hereditament. It is defined as a unit of property capable of commanding a rent. Domestic property is excluded as it is taxed in a different way. 2. From 1. it follows that derelict land, unused land, (and until 2008 unoccupied property) is exempt. Agricultural land has been exempted from rates since the 1920s. 3. The tax falls on the occupier of the property. 4. The tax is a nationally defined proportion or rate of the value of the property. In 2016/17 the main rate is 49.7% with some reduced rates for special cases and even exemptions for some small businesses. 5. The valuation is based on the existing use of the property. 6. The valuation of the property for the purpose of taxation is not necessarily directly related to the rent the tenant actually pays. It is based on a hypothetical “reasonable” value a tenant would pay according to valuation criteria. 7. The valuation is updated every 5 years, but the values are back-dated so although a new valuation came into force in 2010 it was based on 2008 values, before the significant decrease in values brought on by the financial crash. 8. The rateable values are open to public view and are available from the Valuation Office website. 9. There is a system of reliefs for the properties of lowest value. The current rating list has just over 2 million entries. The range of properties dealt with is enormous, from airports and nuclear power stations at the high value end to beach huts at the low value end. The total rateable value is £65.14 billion. At the top end values are in excess of £10 million and at the bottom end are 189,000 properties with values of less than £1000. In April 2008 business rates were extended to include unoccupied property, with the tax is due from the owner. One rationale for this extension was to incentivise the full use of property and hence the land it occupies; an unintended consequence was that owners could render the property unusable and thereby become exempt from the tax. This has resulted in damage or demolition to significant numbers of potentially usable properties to avoid rates. Owners of empty properties have also avoided rates by employing an agency to provide short-term tenants; between short lets when business rates are paid there are vacant periods enjoying a three or six-month rate exemption. Owners can also avoid empty property rates by "letting" rent-free to charities who are exempt; they are also allowed to keep premises empty rate free between charitable uses. Changing the tax base to the site only and extending it to unused land would help to solve many of these problems. 1. The taxable unit is the site only. Buildings and improvements would be exempt. Thus, the taxable unit is defined geographically and could be identified for example, as a basic land and property unit (BLPU) associated with a unique property reference number (UPRN) of Ordnance Survey data. All sites are valued independently even when part of a portfolio with a common owner. All land other than occupied residential land is to be included. There is a huge range of land values in the UK. The average price of agricultural land is around £20,000 per hectare whereas land in central London is valued at several million per hectare. The most comprehensive approach would be to include all land other than occupied residential land where the council tax now operates but recognise that most agricultural land would be zero rated. The tax falls on the owner, not the occupier. Owners typically change less frequently and are much fewer in number than tenants; billing owners directly should ultimately produce considerable simplification. Until the land register is complete, there may be cases where the occupier is easier to identify than the owner; it may be efficient to bill the occupier and support subtraction of the payment from their rental payments to the owner. The ultimate penalty for non-payment could be forfeiture of the freehold. Recent reforms of company law have made it more straight forward to identify beneficial owners where property is held by companies. The tax is a proportion of the site value, an annual rental value of the site, and is billed to the owner annually. Given that the present business rate is around 50% of the rateable value and that the site value is on average around 50% of the total property value if the reform is to be tax neutral the rate would need to be set as quite a high proportion of the site rent. The valuation is based on optimum permitted use not on existing use. This takes into account planning permissions and local development plans. Optimum permitted use is not necessarily the most profitable use. There would be scope here for local communities to become much more pro-active in their planning strategies and to determine for themselves what type of use they wish to permit for the land in their localities. The valuation strategy would be different from that used for business rates where calculations relate to existing use and are based on the nature of the building. It would be based on the annual rental value of the land without improvements. There is a residual method of valuation where the value of the site is obtained by subtracting the value of the construction costs from the market value of the property. However, this tends to undervalue land that is not in optimum permitted use. There are alternative comparative methods which would make use of both recent market transactions and a survey of the location and the surrounding factors that affect land value. The recent revaluation in Northern Ireland provides an example of how this might be done. It requires the use of CAMA (computer-aided mass appraisal) methods using MRA (multiple regression analysis) and GIS (geographic information systems). Values should be updated annually. Modern computerised methods can maintain land value maps in real time, making use of property transaction information, already supplied to VOA and Land Registry, to continuously update valuations. The site values should be on public display. The values for each region would be recorded in a GIS and presented in the form of land value maps. The AREIS (Auditor’s Real Estate Information System) of Lucas County Ohio USA provides an excellent example of an existing system of this kind. In practice this system has been shown to have the additional advantage that the ‘positive feedback’ from the value maps leads to a more efficient, better informed property market. Upwards-only rental agreements must be rendered inoperative at the outset of this programme. These agreements make it difficult for market fluctuations in rent to affect the actual rents paid. As will be seen, this scheme requires rents paid to reflect market levels of rent, moving downwards as well as upwards. A transition from NNDR to SVR would need to be done in steps. The scheme we illustrate here is a five-stage transition which could be introduced, for example, over five consecutive years. During the transition period the occupier would continue to pay the old business rate system but with a 20% reduction each year. Meanwhile the owner would begin paying a site value rate with annual 20% increments over the transition. The rate could be set so that total tax receipts would remain approximately the same. Table 3: Payments by owners and occupiers in proposed five year transition. Estimates of the proportion of property prices that can be attributed to land vary from 30% to over 60% for commercial and industrial property. The current rate is just under 50% of assessed property value, and hence the site value rate would be close to 100% of the rateable value of the land at the time of the reform. This can be reviewed and revised according to political and economic need. It has been the practice with business rates to maintain revenue (its yield) constant in real terms, and only increase it with inflation. During a property boom the business rates’ yield decreases as a proportion of property values, and during the subsequent bust it increases. This policy has prevented NNDR being used as a tool to control speculative bubbles in commercial property values. Land value is the dominant contributor to fluctuating property value through these cycles, and the reformed site value rates are linked directly to land values. With rising and also falling land values there would be corresponding rising and falling public revenue; this would provide an effective and natural dampener to speculative bubbles since owners would enjoy little of the ‘unearned increment’ from such speculation as it would instead fall to the public purse. Hence the site value rating system would be an effective method of land value capture. There are three notable mechanisms at play to bring benefit from the introduction of SVR. 1. Restrictions in the supply of land and increases in demand always tend to drive occupancy costs upwards; access to land is an essential requisite for any enterprise, and so under the present arrangements landlords are able to charge a rent that is the most tenants can afford. In other words, supply of land is so inelastic that the normal competitive market mechanism of supply adjusting to meet demand and regulate price does not happen. 2. The most that tenants can afford to pay relates not just to rent but to the total occupancy cost (TOC). This will tend to remain constant for a certain set of conditions. TOC = rent + rates. Hence if rates are reduced, for example in enterprise zones, the effect is that rents simply rise correspondingly. Conversely when rates rise there is strong downward pressure on rents. 3. Wherever the incidence of taxation falls, it tends to shrink. Thus, the taxation of alcohol and tobacco is intended to reduce consumption. The window tax is an almost farcical example of this. Taxing capital reduces its production and use. Conversely the reduction of the taxation of any aspect of the economy will encourage that. 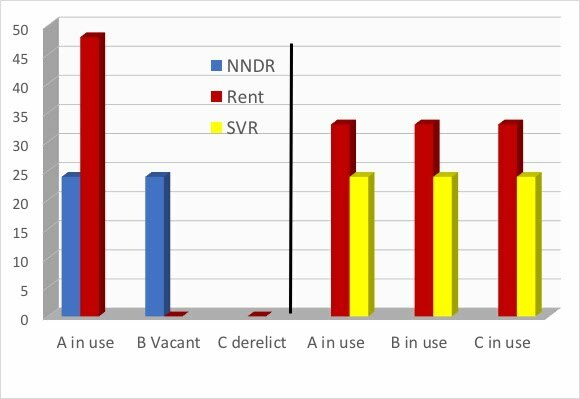 The effects of replacing NNDR with SVR are examined for three different scenarios to anticipate what the outcome might be given the mechanisms mentioned above: firstly marginal locations where economic activity may be just sustainable, secondly owner-occupied sites, and thirdly the case of tenant-occupied sites. The first illustration is for the situation that is likely to occur in a marginal area where businesses find it hard to stay viable. In the illustration (Figure 1) three sites of similar site value have differing states of occupation. Site A’s tenant is just able to pay the rent plus rates (i.e. the TOC); site B is unoccupied but with the owner still subject to rates. The possibility of the owner taking steps to avoid NNDR will be ignored here and becomes irrelevant under SVR. Site C is unoccupiable and hence not subject to business rates. Figure 1 shows these three cases under NNDR (left) and again under SVR (right) after the complete transition. SVR will be the same on all three, being proportional to the rental value determined for best permitted use, and independent of site development or state of use. When SVR is levied it is probable that the effect will be to lower rents overall and on these three sites in particular. The reason is that the owner of site C (unoccupiable or derelict) will be encouraged to develop the site to find a tenant to pay the SVR. Site B (unoccupied) will also be encouraged to find a tenant; both these movements will tend to transform the present seller’s market into more of a buyer’s market. Rents will tend towards the real costs of buildings and services, and any rent premiums due to shortages or the advantages of the location will reduce. Site A’s owner may attempt passing SVR onto the tenant through higher rent but will be inhibited by this new market condition. Site owners are likely to ensure buildings are better developed to command higher rents, whilst tenants should see lower rents as the market becomes more competitive. The commercial property market will have more to do with buildings and development and less to do with speculative landholding. According to the Investment Property Forum Report, owner-occupiers represent 38% of the commercial property the owners of these will see no effective change in the incidence of tax, merely a shift of their role from paying tax as an occupier to paying as an owner. As SVR applies to site value under best permitted use rather than property value, any change in the level of tax paid will depend on the ratio between these values; those owning highly developed sites will pay less whilst those on underdeveloped sites may pay more. One likely effect of SVR replacing NNDR is that land will be used more efficiently. Figure 2 compares sites having the same rateable values (and hence business rates) but differing site values to represent various levels of site development; also included is a vacant (unoccupiable) site on a prime location. In this example, it is assumed that a rateable value of £100,000 mean £40,000 is paid annually as NNDR except on the vacant site. Marginal locations (A) with minimal or below threshold site values are currently subject to NNDR but would pay a very low SVR. An example would be a specialised recycling plant in a remote location; with the upward pressure on rents curbed by competition, operating costs are likely to fall. Sites with site-values below 40% of the rateable value but well-developed (B) will also see reduced tax. Sites with site-values above 40% of the rateable value that are under-developed (D, E) would pay more. The most significant change would be for vacant (unoccupiable) sites (F) which are currently excluded from NNDR but would now pay according to the site’s best permitted use; this is shown in Figure 2 assuming F occupies a prime location. Figure 3 shows the same effect by comparing similar sites with the same SVR values of say £50,000 but different degrees of development. A is assumed to be fully developed, and B, C and D to have progressively lesser degrees of development and b to be vacant site. Under NNDR there would be a corresponding decrease in business rates payable. The higher payments under SVR will encourage vacant (unoccupiable) sites (E) into use, and under-developed sites (C, D) into more efficient use; well-developed sites (A) will pay less under SVR. For sites with tenants, there will be a shift in the incidence of tax from occupier to owner over the proposed five-year period. Under present arrangements, tenants tend to pay the most they can afford for their total occupancy costs as combined property tax and rent (TOC). All other things being equal, as NNDR gradually transitions to SVR, tenants will continue to pay roughly the same TOC and effectively pay the SVR via the owner as illustrated in Figure 4; the owner is able to cross-charge the tenant as there is no change in their ability to pay TOC. However, due to the pressure to bring previously underutilised land onto the market, as illustrated in the first example of the marginal site, there is likely to be an increase in supply leading to downward pressure on rents. For this to affect the market upward only rent agreements would need to be overridden. Figure 5 illustrates what would occur where the downward pressure on rent just balanced the gradual introduction of SVR, just preventing the owner raising the rent to maintain their revenue. The end result is that rent is only paid on buildings and services, not on the site. For owner-occupiers the transfer of the business rates onto land will tend to reward those who have developed their sites to the full, leading to increased land use efficiency. For owners of underdeveloped land, SVR will tend to act as an incentive to develop them towards their full potential. For owners of unused land, SVR will tend to encourage its development into use or sale, leading to a downward pressure on rents. There is a large body of empirical evidence from the United States that this type of tax shift does stimulate development. It is important to recognise that any such development must take place within the confines of “optimum permitted use” as determined by planning authorities. Potential site value, the basis for SVR, is likewise within the same confines. Therefore, a shift to SVR is expected to stimulate development and lead to an increase in the supply of commercial property and reduction in some rent. Although the plan passing through parliament will have an immediate effect on the value of speculative holding of land out of use, there is likely to be some delay before such land is developed into use, and other changes such as dealing with upwards-only rental agreements will also need to be dealt with. The five-year phasing of this proposal should give enough time for the property markets and industry to adjust and respond, ensuring minimal market disruption for business tenants. As SVR is more sympathetic to locality than NNDR, it is expected and could enable growth of smaller traders, in the retail sector for example. In section II the delicate state of investors in commercial property after GFC was noted. Investment property tends to be the high value end of the property spectrum and of well-developed sites. Such sites are likely to benefit financially from the reforms through the reduction in tax paid. As previously discussed, SVR is likely to inhibit some of the speculative activity that leads to the likes of GFC; this is more likely if SVR were eventually extended to include domestic property by replacing council tax. Sites that are close to being marginal will benefit through a reduction of tax paid alongside falling rent. It is not uncommon for regional development to be encouraged through exemption of NNDR, but the likelihood of rents rising in response tends to stymie such an aspiration. SVR inherently encourages regional development and prevents such diversion of national or regional aims. This reform of business rates is likely to have a significant effect on the land market and the land pipeline (aka land bank). Each aspect of the land pipeline needs consideration (refer to Section II). Tax levied on sites with detailed permission (phases C, D) can be expected to reduce timescales and hence reduce the amount of land in the pipeline. Local markets for homes with their typically limited capacity to absorb new houses may constrain sales, which may lead to reduced scales of development. According to the Barratt report, new build house prices are influenced by the prices of existing stock; as the proposed site-value rating does not extend the residential sector there may be some boundary effects, but the expectation is that land prices everywhere will tend to be moderated. Plots in phase B (planning application under consideration) would warrant special treatment without constraints on how long planning departments take to process applications, but this can be reviewed if the need arises. Phase A sites, “identified but planning application is in preparation”, may also need special consideration. Taxation of these is likely to reduce the size of this category, hopefully through rapid preparation and filing of planning applications; if all land other than that subject to council tax were included in the scheme, obscuration would be significantly reduced. Any fall in land prices is a falling cost for both builders and the eventual tenants; there should be no loss of earnings for the building industry. Land speculative holding is likely to be significantly reduced. The value of land, as distinct from developed in-use property, as an investment asset will be greatly diminished. Any projected increase in capital value of sites – but not of buildings - will be absorbed in increased SVR payments. This in turn would affect the basis of valuation of land for tax purposes. The complex and intimate feedback between changes in tax policy and market behaviour and the need for public accountability would make it essential to have regular (at least annual) and transparent site revaluations that are made freely available for all e.g. by publication on the internet and in local libraries. When effective infrastructure is put in place close to a site, for example a new train line, it is well known that land values increase. With the reformed rate, using annual updates of site value, these uplifts would be captured by the tax. Thus, the reformed rate could become a means of financing infrastructure development, more effective than the present system which only captures any of the uplift after at least 5 years (when the next revaluation takes effect). Conversely, if there were a change close to a site that had a negative effect on land values there would be a corresponding reduction in the tax paid. This paper has been an attempt to flesh out the consequences of the reform to business rates proposed in the Liberal Democrat election manifesto and the Mirrlees Review. In addition to establishing the usefulness or otherwise of the proposal another purpose was to clarify what research it would be useful to undertake to establish how effective the reform would be in practice. A key piece of data that is needed to properly assess the proposal is the ratio of site value to total value for commercial properties. The proposed changes transform business rates from a property tax into a resource levy. The reform of business rates thus needs to be seen in a wider context of establishing a “sustainable land development policy” that looks in a holistic way at the proper utilisation of this most important resource. Tax revenue is just one component of this. Planning is another aspect as is valuation and the establishment of the identity of owners of all sites. This proposal is part of a wider programme of the CEJ’s (Coalition for Economic Justice) proposal for a general shift of taxation off production and onto land. The economic and social reasons for the reform have been discussed in detail in other CEJ papers. Dimensions of Tax Design: the Mirrlees Review, J. Mirrlees, S. Adam, T. Besley, R. Blundell, S. Bond, R. Chote, M. Gammie, P. Johnson, G. Myles and J. Poterba (eds), Oxford University Press 2011. Investment Property Forum Report, The size and structure of the UK Property Market, End-2016 update July 2017. Lux, Dr N. UK Commercial Property Lending Market Research Report- Year End 2016, Department of Corporate Development, De Montfort University, 2017. Muellbauer, J. Property taxation and the economy after the Barker Review, The Economic Journal 115 C99-C117 (2005). Autumn Budget 2017, section 5.12. The Role of Land Pipelines in the UK Housebuilding process, Chamberlain Walker for Barratts, September 2007. Connellan O. Land Value Taxation in Britain Experience and Opportunities, Lincoln Institute for Land Policy, 2004. Vickers, A. Visualising Landvaluescape: developing the case for Britain, PhD Thesis University of Kingston Upon Thames, 2009. Plassman, F. & Tideman, N. A Markov Chain Monte-Carlo Analysis of the Effect of Two-Rate Property Taxes on Construction Journal of Urban Economics 47(2): 216-247, 1999.